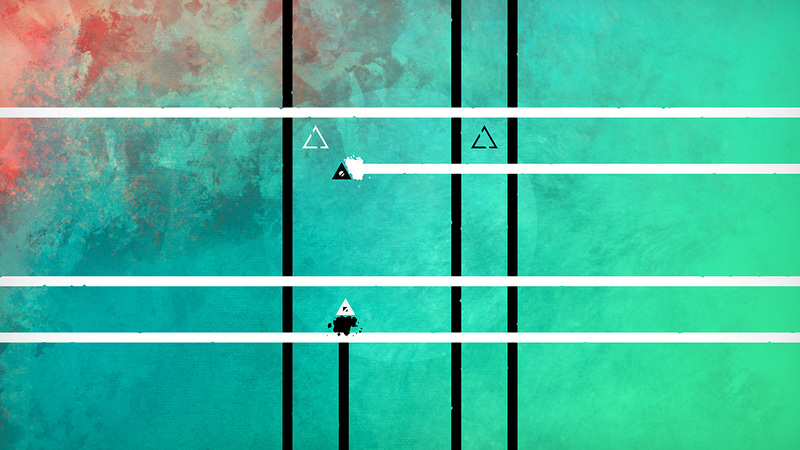 Every week multiple smaller indie titles are passed over for the more spotlighted offerings, and this is especially true of the minimalistic puzzlers. 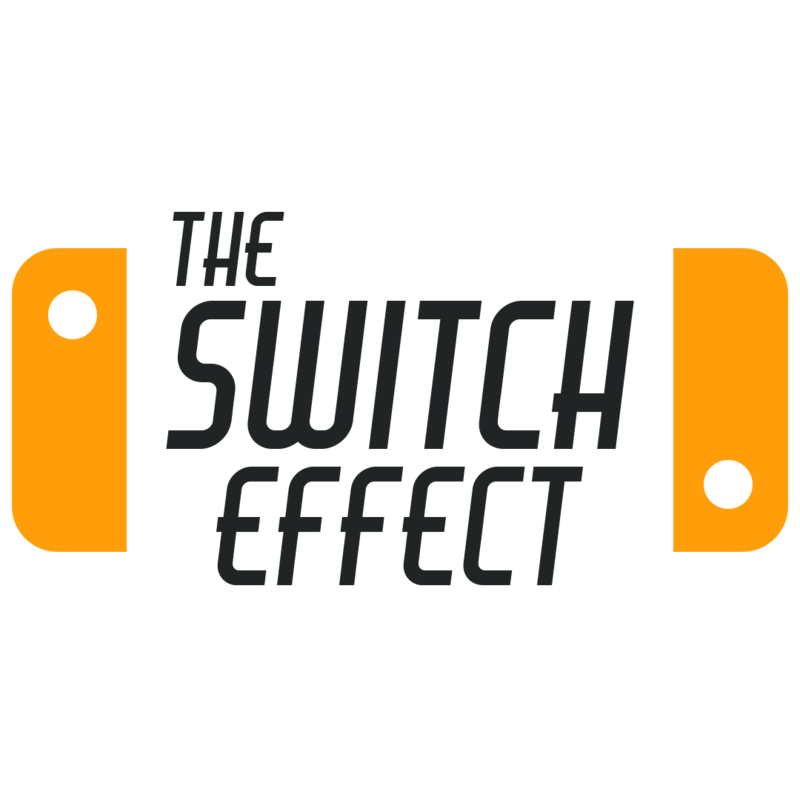 This genre is one of my favorite’s on the Nintendo Switch, mainly due to their simplicity and quick play sessions that don’t depend on your absolute attention. 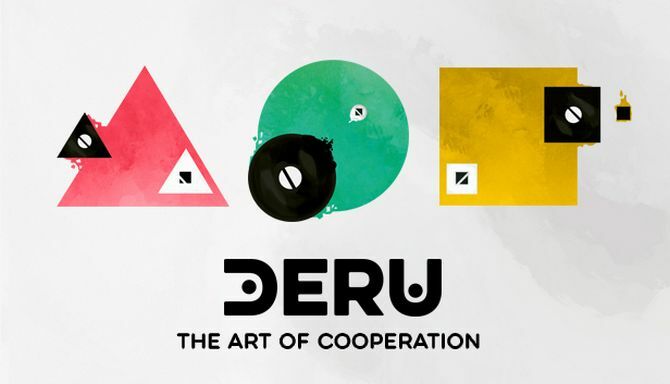 Deru – The Art of Cooperation, from developer Ink Kit, is a textbook example of taking a simple puzzle title and making it not only accessible, but also challenging to provide for an enjoyable puzzle-solving experience. Deru – The Art of Cooperation has a straightforward premise. 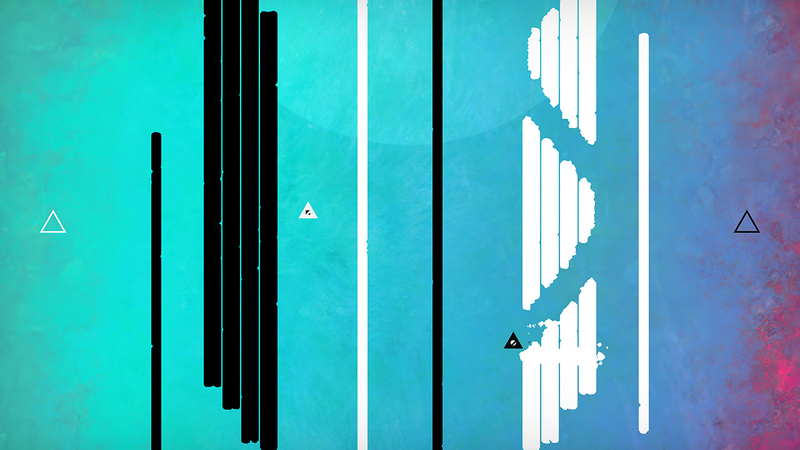 You or another player control two triangles, one being black and the other white. Your goal is to find the silhouette of your shapes color and try to get your shape to that spot. Where the challenge comes in is that there are black and white streams blocking your progress to the silhouettes. This is where you must use your color’s shape to block the opposite color and the same must go for the other shape. You’ll have to work together with a friend in order to accomplish this, or Deru can be played by yourself with each analog stick controlling a separate shape. You will find that each stage will require a high level of thought and coordination in order to successfully know when and how to block each stream. Playing by myself, I found that I wore myself out mentally rather quickly and found Deru to be much more enjoyable with two players. Like any great puzzler, the stages become more complex and new mechanics are introduced as you progress further through the 75 or so stages. You will have to deal with more shapes and even your shapes will grow when you make it to the further levels. The music and graphics are subdued in their beauty with a minimalistic approach with the presentation. 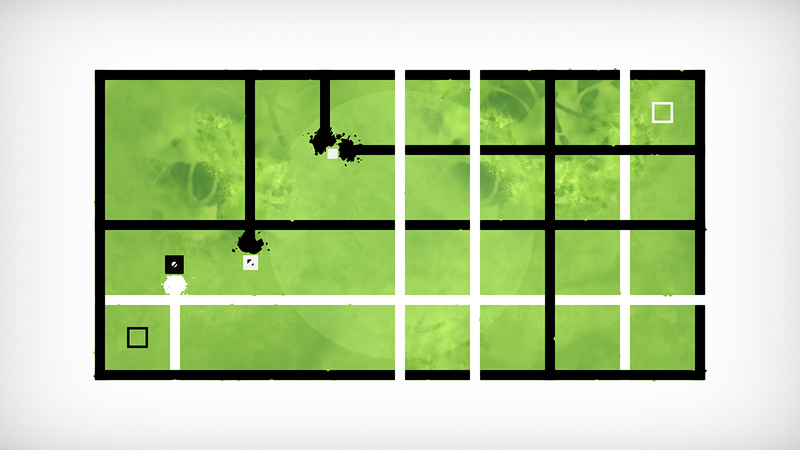 Using colorful backgrounds with the black and white shapes you use really provided a sense of calming, even with some levels feeling immensely challenging to solve. 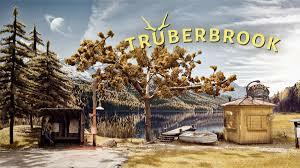 The soundtrack is filled with ambience and provided a calming and relaxing atmosphere to better solve the puzzles and meshed very well with the art aesthetic. 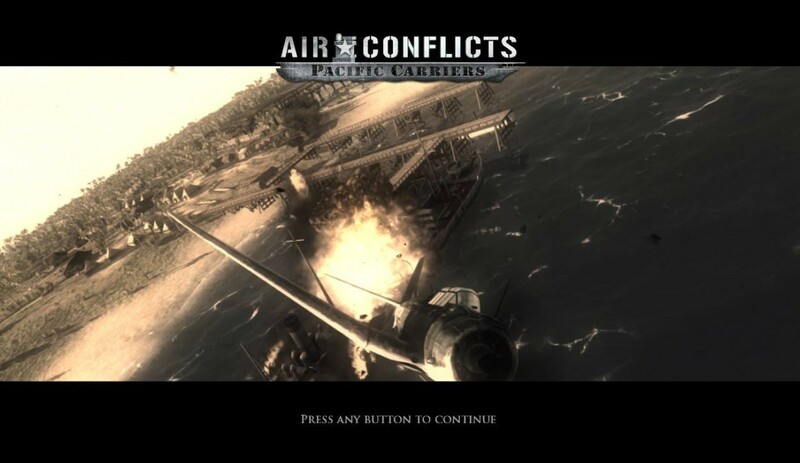 Gameplay does not involve much, as you are only able to move the shapes with the analog sticks and maybe press a button to use an ability in the later levels. It was incredibly easy to pick up and play, and was a great example of how simplicity can sometimes make for a more enjoyable experience, especially playing with friends. I did wish though, that you could have moved the shapes faster, as they start out moving at a snail’s pace and have to accelerate up to speed. This caused some unintended failures at times, but wasn’t too terribly inconvenient. Deru had a great way of providing a gradual ramp-up of difficulty to the puzzles as you progress. When you first begin, you start out as a triangle with no abilities. However, once you gain the circle some new gameplay elements come into play. You can use the circle’s ability to allow for sharing its mass to another shape, which in turn allows it to become smaller or larger. Finally, there’s the square, which has the ability to break into smaller pieces, perfect for blocking multiple different colored streams. 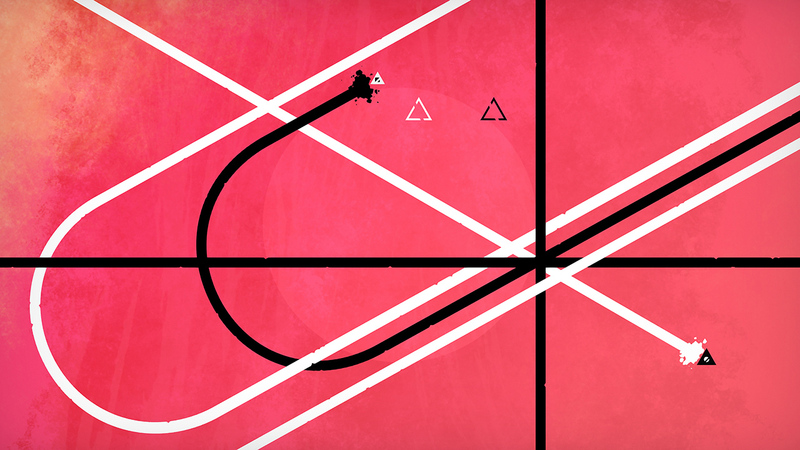 This may not seem like enough gameplay variance, however, once you get to the later stages and have to manipulate two different shapes, there are some clever puzzle solutions to try and find out. I never became bored during my play through with many of the puzzles having great design and clever puzzle solving mechanics. With only being able to use a few gameplay mechanics, I was surprised at how well thought-out solving the puzzles actually were. Each level felt unique and while they do share similar concepts, it was satisfying to solve a puzzle either with a friend or using two different parts of my brain to find out. While the difficulty curve in Deru was for the most part excellent, there were a few occasions where some puzzles were considerably easier or harder for their respective positions. I found the challenges to be fair without feeling repetitive or making me bored, and rarely left me frustrated. For an easier time as stated before, Deru is meant to be a cooperative experience and I found the greatest amount of enjoyment from playing this way. Similar to Overcooked, you may become frustrated when your partner doesn’t do what you want, but the laid-back nature of the title really made it easy to just relax and focus on solving the puzzles. Playing solo works well for the most part, but it did add unneeded challenge and became more frustrating when not playing with someone else. Overall, Deru – The Art of Cooperation is a worthy puzzler to add to your Switch collection, as long as you have a friend to play with. Despite the simple concept and rather short play time, I enjoyed solving these puzzles and the concept is novel enough to remain compelling. Deru can be played alone, but does not come recommended that way, and fortunately is simple enough to be enjoyed by almost anyone.